A narrative history of the largest manmade detonation prior to Hiroshima. On Monday, December 3, 1917, the French freighter SS Mont-Blanc set sail from Brooklyn carrying the largest cache of explosives ever loaded onto a ship, including 2,300 tons of picric acid, an unstable, poisonous chemical more powerful than TNT. The U.S. had just recently entered World War I, and the ordnance was bound for the battlefields of France, to help the Allies break the grueling stalemate that had protracted the fighting for nearly four years. The explosives were so dangerous that Captain Aimé Le Medec took unprecedented safety measures, including banning the crew from smoking, lighting matches, or even touching a drop of liquor. Sailing north, the Mont-Blanc faced deadly danger, enduring a terrifying snowstorm off the coast of Maine and evading stealthy enemy U-boats hunting the waters of the Atlantic. But it was in Nova Scotia that an extraordinary disaster awaited. As the Mont-Blanc waited to dock in Halifax, it was struck by a Norwegian relief ship, the Imo,charging out of port. 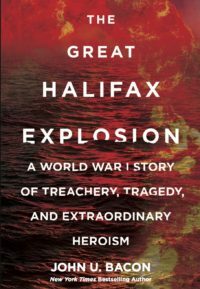 A small fire on the freighter’s deck caused by the impact ignited the explosives below, resulting in a horrific blast that, in one fifteenth of a second, leveled 325 acres of Halifax—killing more than 1,000 people and wounding 9,000 more. Bacon combines research and eyewitness accounts to re-create the tragedy and its aftermath, including the international effort to rebuild the devastated port city.